Tool menu - Every site has a tool menu on the left-hand side of the screen. Favorite Sites list - You can select favorite sites to appear at the top of the screen after you log in, for quick access to them. Content - The area that contains the site where you are working. The information on Access keys in this note provided by WebAIM.org. You can learn more about Access keys on their website, Keyboard Accessibility © WebAIM. 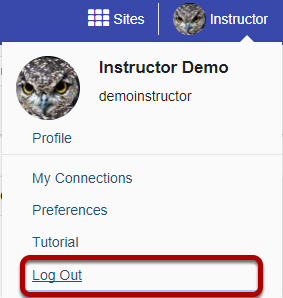 Location: When logged in, the Logout link is the fifth link listed in the user menu. If you have a large number of favorite sites in this list, some sites will not be displayed due to space limitations. Any sites not displayed are contained in a submenu accessed via the Sites link. The rest of the sites you may be a member of can also be found in the Home > Membership or Home > Worksite Setup area. Location: right after the current site's tools list (at the bottom of the screen) is a link to minimize the tools list. The title of the tool you are currently viewing. Selecting the link for the tool title will reset the tool to its initial state. Help link, with an icon that resembles a small blue circle with a question mark (?). The Help link opens a new window with help documentation for the tool you're viewing. Depending on the tool you are viewing and the permissions you have in the site, the title will be followed by one or more links in an action toolbar. 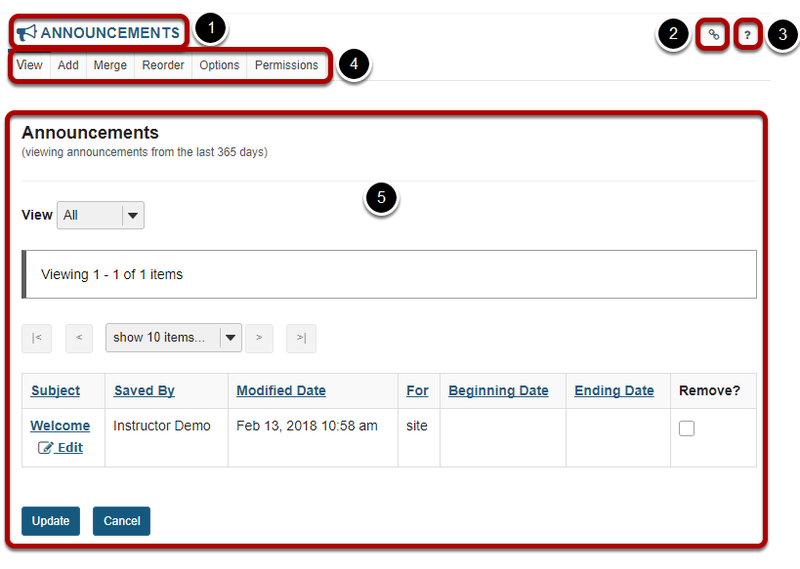 This toolbar contains links for actions on the content (creating new items, navigating to other views, etc.). This area contains a list of three links: Gateway which takes you to the main page (similar to a homepage) of the current Sakai instance, Accessibility Information about Sakai, and The Sakai Project which takes you to the Sakai project home page. This section also contains the copyright information, the current version/build of Sakai, and server information. All tools use a rich text editor to allow users to create content. You will find this editor while adding resources, creating announcements, responding to assignments, etc. Alt+0 – opens Accessibility Instructions within the editor. Note: For a complete list of all keyboard commands, please see the CKEditor Accessibility Guide.